"Sequences New York/New Jersey 1990-1993: Recent Photographs by sculptor & artist George Segal"
Akita Senshu Museum of Art, Akita, Japan (11/1-12/4/01) (catalogue). 2003 "George Segal Retrospective: From the Artist's Studio"
"George Segal: Works on Paper", curator: Diane Kelder, The Graduate Center Art Gallery, City University of New York (catalogue). "George Segal (1924-2000) Selections from the George & Helen Segal Foundation"
Co-curators: Rena Segal and Ricardo Viera, Zoellner Arts Center, Lehigh University, Bethlehem, PA (catalogue). "George Segal: Selections from the George and Helen Segal Foundation"
2006 "Essence in a Glimpse: Thoughts on the Art of George Segal", Montclair State University, Upper Montclair, NJ. 2007 Galerie Marwan Hoss, FIAC, Paris. "George Segal Street Scenes", Madison Museum of Contemporary Art, (catalogue) (9/13/08 – 12/28/08). "George Segal Sculpture and Drawings", McClain Gallery, Houston, TX. 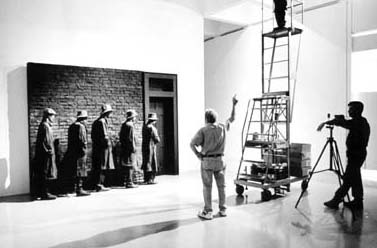 "George Segal: The Expulsion and Documentary Photos by Donald Lokuta" Skirball Cultural Center, Los Angeles, CA. "George Segal: Sculptor as Photographer" Milberg Gallery, Firestone Library, Princeton University, NJ. 2012 "George Segal in Conext" Princeton University Art Museum, Princeton University, NJ.